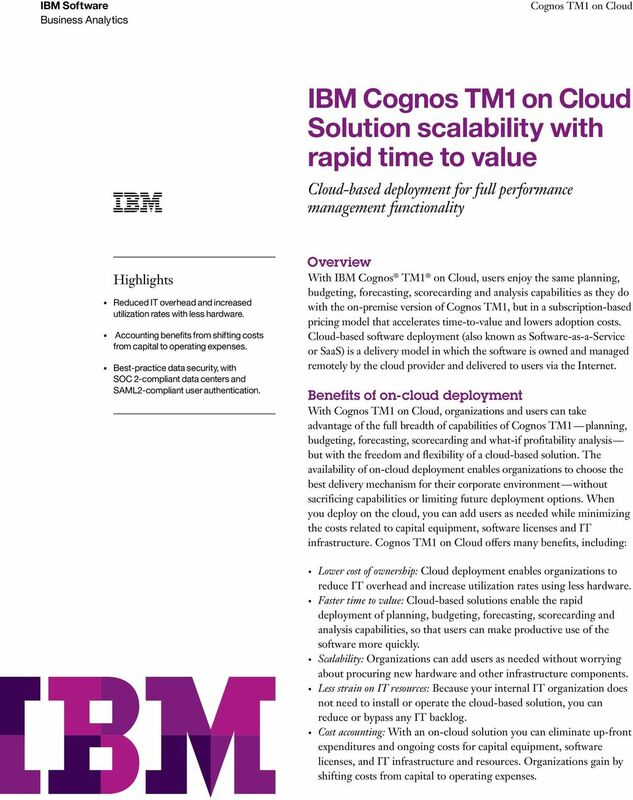 Download "IBM Cognos TM1 on Cloud Solution scalability with rapid time to value"
1 IBM Solution scalability with rapid time to value Cloud-based deployment for full performance management functionality Highlights Reduced IT overhead and increased utilization rates with less hardware. Accounting benefits from shifting costs from capital to operating expenses. Best-practice data security, with SOC 2-compliant data centers and SAML2-compliant user authentication. 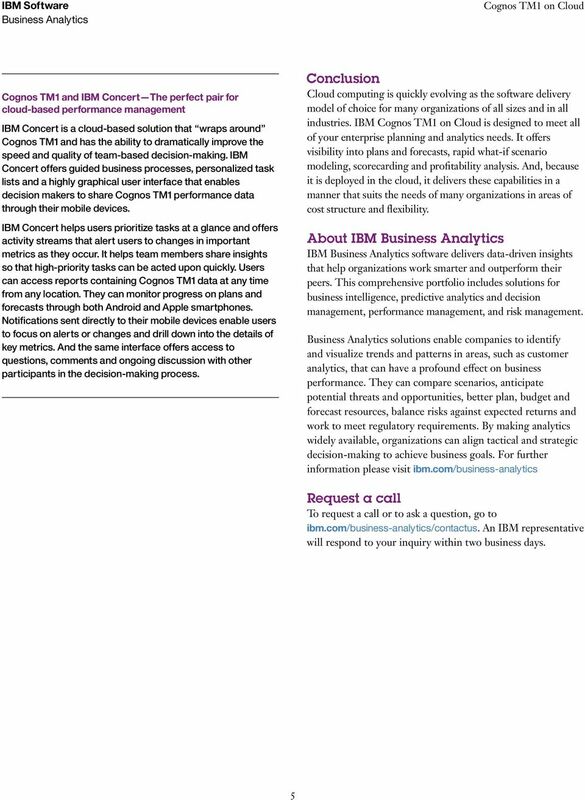 Overview With IBM Cognos TM1 on Cloud, users enjoy the same planning, budgeting, forecasting, scorecarding and analysis capabilities as they do with the on-premise version of Cognos TM1, but in a subscription-based pricing model that accelerates time-to-value and lowers adoption costs. Cloud-based software deployment (also known as Software-as-a-Service or SaaS) is a delivery model in which the software is owned and managed remotely by the cloud provider and delivered to users via the Internet. 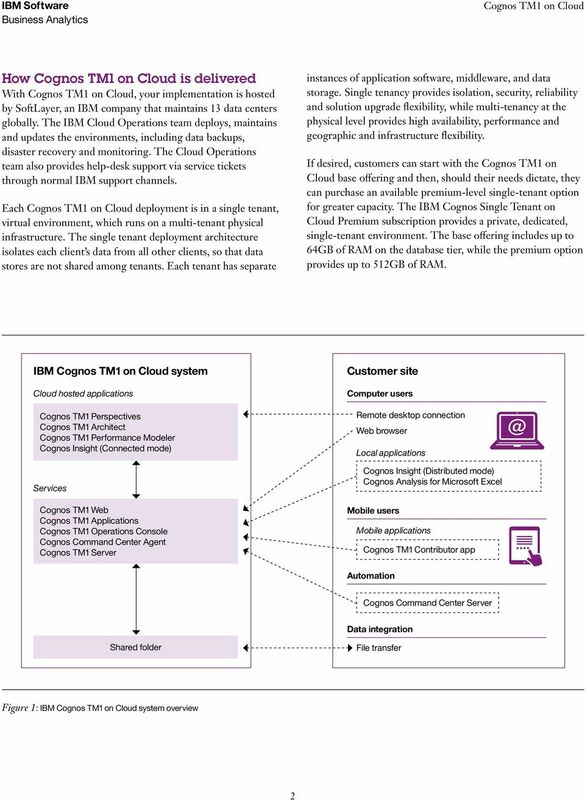 Benefits of on-cloud deployment With, organizations and users can take advantage of the full breadth of capabilities of Cognos TM1 planning, budgeting, forecasting, scorecarding and what-if profitability analysis but with the freedom and flexibility of a cloud-based solution. The availability of on-cloud deployment enables organizations to choose the best delivery mechanism for their corporate environment without sacrificing capabilities or limiting future deployment options. When you deploy on the cloud, you can add users as needed while minimizing the costs related to capital equipment, software licenses and IT infrastructure. offers many benefits, including: Lower cost of ownership: Cloud deployment enables organizations to reduce IT overhead and increase utilization rates using less hardware. Faster time to value: Cloud-based solutions enable the rapid deployment of planning, budgeting, forecasting, scorecarding and analysis capabilities, so that users can make productive use of the software more quickly. Scalability: Organizations can add users as needed without worrying about procuring new hardware and other infrastructure components. Less strain on IT resources: Because your internal IT organization does not need to install or operate the cloud-based solution, you can reduce or bypass any IT backlog. Cost accounting: With an on-cloud solution you can eliminate up-front expenditures and ongoing costs for capital equipment, software licenses, and IT infrastructure and resources. Organizations gain by shifting costs from capital to operating expenses. IBM Virtual Server Services A smarter way to support and grow your business 2 IBM Virtual Server Services Take control of IT complexity, cost and security Are you managing a complex server infrastructure?